What is an SEO Title Tag? A title tag is a segment of HTML code that signifies the title of a webpage. They appear as the clickable portion of a search result on search engine results pages (SERPs). To ensure your title displays properly on SERPs, it is optimal to keep its length to 60 characters. There’s several things to unpack in the examples above. First, an established company needs less modifiers or ancillary / secondary words. Why? Because they have a greater chance of ranking for the highest volume keywords, which happen to be shorter in most cases. Air conditioner repair, for example, has a much higher volume than emergency air conditioner repair. But a brand new company should utilize the latter because that’s all they can rank for right now. As for bad title tags, they usually stem from either keyword stuffing (including city / location stuffing) or a lack of clarity (using your company name only & not your industry). Obviously, both should be avoided at all times. The same process would be applied to each secondary page (sub page) and of course vary by the topic and main keyword. It’s prudent to always add the location of your HVAC company to the secondary title tags. This is especially useful for newer brands who really rely on SEO details to get their page ranked as high as possible, but is still critical for established brands as well, as they want to fend off competitors who are doing “the little things” to try to close the gap. Other factors are considered of course, including the quality of the content on the page itself. H1s are the most valuable header tags from an SEO standpoint, but don’t underestimate the value of H2s either. As for H3s, they are less significant, but can still be useful from a format and structure perspective. Remember, the intention of SEO is not only to achieve a higher ranking through refinement, but also through user engagement. If you can provide structured content that engages the reader and keeps them on your website longer, your website is signaling important metrics that can increase its ranking. Google’s allegiance is to its users, as it should be. 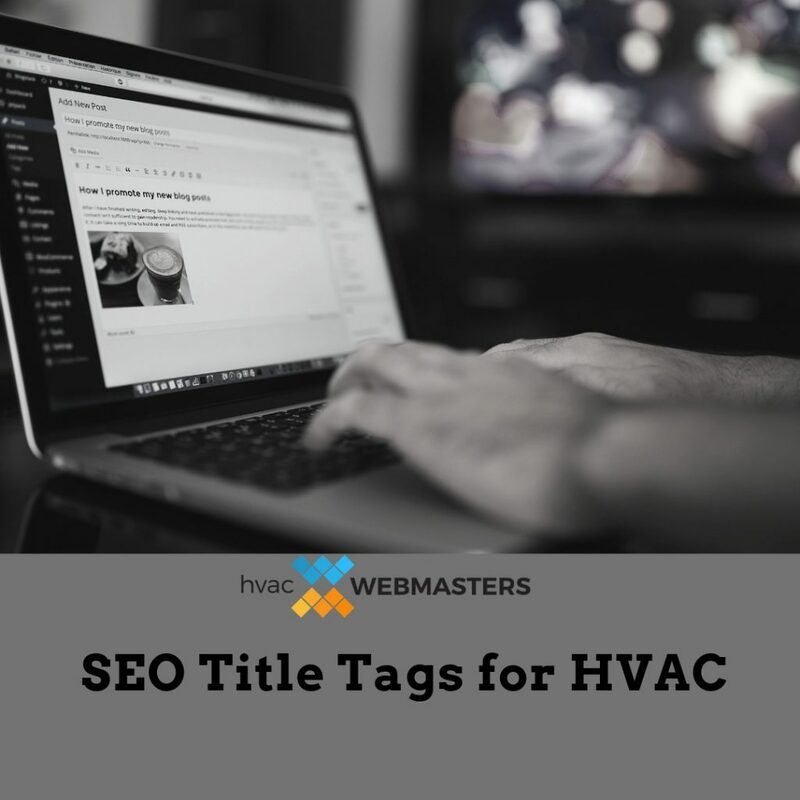 If this all sounds too tenuous for you to handle on your own, you can invest in on page SEO services from HVAC Webmasters. You can also check out our HVAC Marketing Guide for 2019 in the meantime. As a digital marketing company that specializes in promoting HVAC contractors, we possess unique insights into search engine optimization for companies like yours. Our team is small (15 people) but diversely talented and has collective skills that range from custom website design to Google Maps optimization. If you’d like to get a quote or discuss your existing situation further, call us now at (800) 353-3409 for a free SEO analysis.